Seven years ago, in a breakout exhibition of sorts called Positive Space at the much-missed New BLK Gallery, mixed media artist Justin Beller made a strong first impression on his patrons, current and future, as well as this writer. 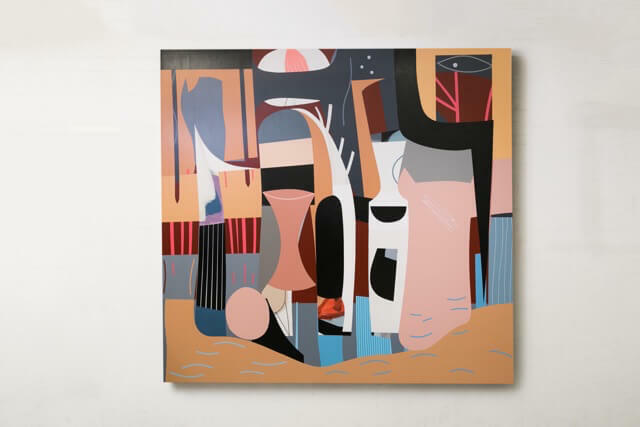 Although he included paintings in Positive Space, “The biggest surprises in this show are Beller’s intriguing wall installation and stand-alone painted sculptures that also experiment with spatial perspective and perception,” I wrote in an Omaha City Weekly review. Since then Beller’s 2D and 3D work has made a significant impact on regional interior and urban design featured in dozens of private, corporate and small business collections. 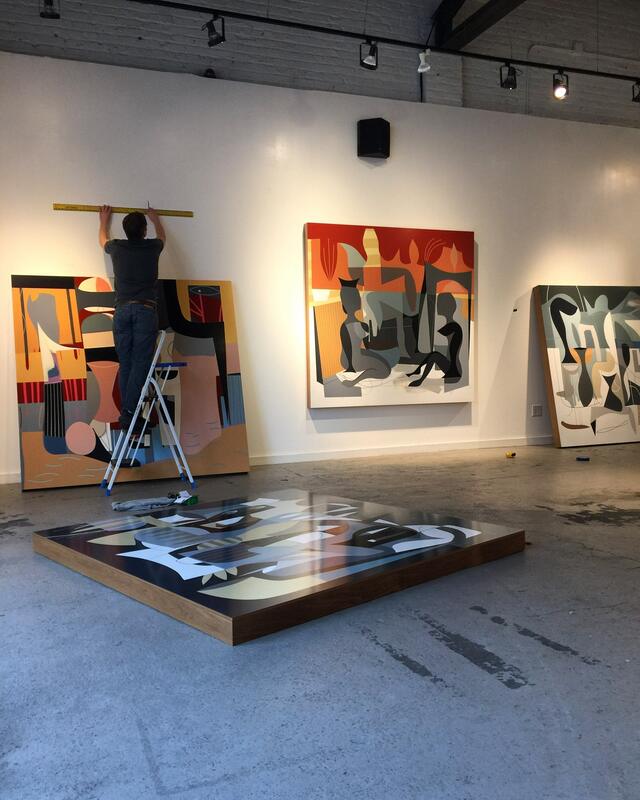 But if you are only familiar with the artist’s past success, his new Trajectories, opening at Anderson O’Brien Gallery May 4, from 5-8 p.m. and continuing through May 27, should come as a pleasant surprise. 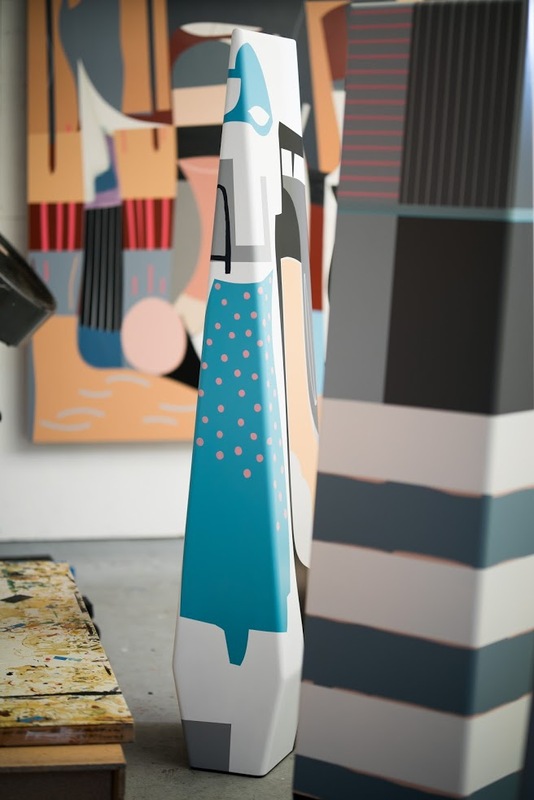 WhileTrajectories points to a new direction for Beller’s latest series of paintings, installations, plinths and towers, the show statement more than hints that his hard-edged, geometric abstraction has found its more “feminine side”. “Feminine,” because although there is no absolute standard, it is a commonly held belief that all genders possess a yin-yang polarity that includes empathy, sensitivity, caring, compassion, tolerance, and nurturing along with traditional male qualities such as protectiveness, competitiveness, assertiveness, aggression, passion and confidence. 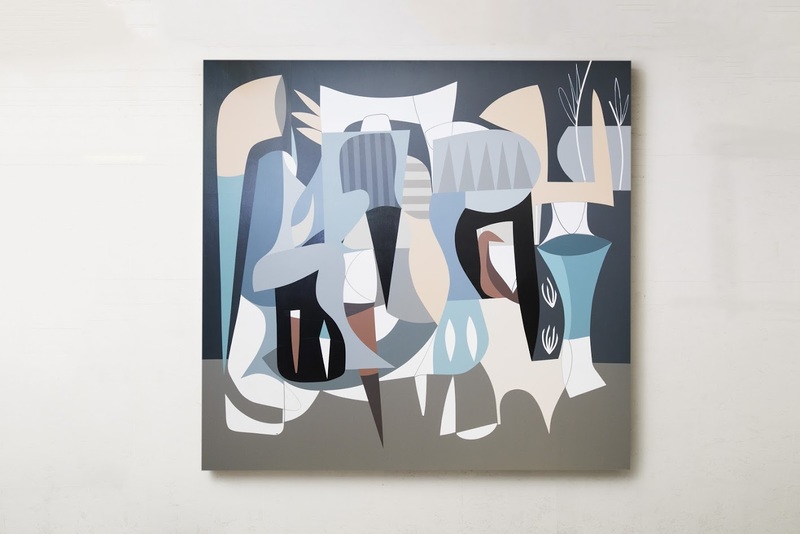 The new trajectory then reflects this paradox of influences that balance Beller’s current work, because just as such pieces as “Progression” and “Ripen” are indeed softer, more gestural and suggestive, he hasn’t lost his edge, eye or exactness. Ironically, Beller says, this new direction was a nod to both the past and the present. Freedom yes, but Beller is careful to point out that while the subject may have changed, the process is still as demanding if not more so especially as to space, composition and structure. He hasn’t abandoned what he has learned by process or put into practice for more than a decade. 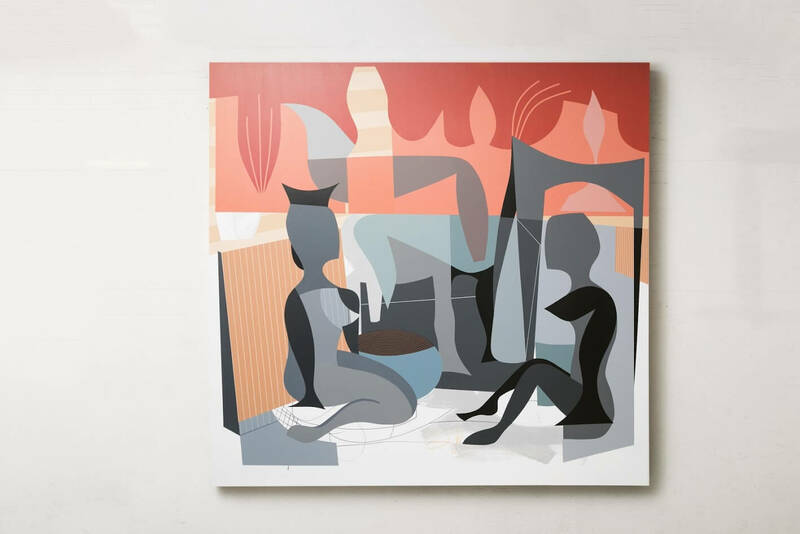 There is also another balance evident in Trajectories, more prominent than in previous exhibits, and that is the relationship between positive and negative space, the result of which places greater demands on the viewer but may be more rewarding. That interaction also alludes to Beller’s more expressive, psychological side as he begins to open himself up to his patrons, especially in his deliberate placement of tower “Compass” and “Progression” a painting, which depicts two sitting figures, stand-ins perhaps for him and his wife. Gone is the cool abstraction the artist is noted for as these two engaging silhouettes face each other equal on the same level field, different yet striking similar in form and structure. As noted, the artist is deeply involved in that conversation, that narrative; the work is more contemplative, meditative, less detached. He says he’s “at a different stage in my life.” So is his work with its revisited past and new-found sensitivity, but as Trajectories clearly demonstrates, no less accomplished or satisfying. The viewer may find it even more so. Justin Beller’s Trajectories continues until May 27 atAnderson O’Brien Fine Art in the Old Market at 1108 Jackson St. For more info and gallery hours, got to aobfineart.com.